I got a call from Jake Herzog during the winter of 2003-2004 to say that he and Jim Hoellerich were talking about riding to Alaska, and he asked if I might be interested in going along. He said it would be Jim’s first time, and that Jim was enthused about going. It would be my 8th time, but I welcomed the chance to go again, especially with Jake and Jim, even though I planned to go the next year for my granddaughter Asia's graduation from UAA. Other than my family’s concerns about my age and poor eyesight, the only concern I had was with sleeping arrangements for three. I didn't know how we would deal with it this time, but the problem resolved itself when Jake called a few months later to say that he had to cancel because his daughter was about to give birth to his and Arlene's first grandchild during the time we would be away. When I discussed the change with Jim, he said he was sorry about Jake’s not going, but he still wanted to go. Without hesitation, I agreed to go with him. My first obstacle came two weeks later, not long before we were scheduled to leave, when my primary bike of the time, the BMW R1150GS that I rode to Alaska in 2001, blew the main bearing in its transmission during an impromptu trip to Rhode Island to pick up some old enduro photos for a book I was working on. It was a blessing that it didn't fail while we were on the Alaska trip. After returning with the growling gearbox, I paid a visit to my two closest BMW dealers, neither of which would agree to fix it prior to our date to leave. I figured that the easiest solution would be to use the 2003 BMW F650GS Dakar that had been sitting in my garage for more than a year. I had put about 5,000 miles on it during that time and I loved it. It was also well broken in, and it was certainly capable. One concern was its carrying capacity for an Alaska trip. The only good place to stow luggage was in the tank bag and tank panniers, with a minimal amount on the rear carrier, far enough forward to avoid handling problems. I had planned to take it to Alaska the following year, which would have given extra time to set it up properly with street tires and side cases. Having bought the bike in hopes of eventually using it as my primary adventure touring machine, I had already taken the original windshield to Gustafsson Plastics in St. Augustine, FL in early March for him to use as a template to make a taller windshield for it. He was busy at the time, so I left it with him. All I had to do now was get him to finish it and send it back. But we were already halfway through June and the bike was still without a windshield. I was on the phone several times during those last few weeks trying to get him to finish it up and ship it. I explained my situation and pleaded with him to either give it a little more effort or send back the original, and I'd use that. I ran into another problem while testing a new set of temporary lightweight leather throw-over saddlebags. Before I could come up with ideas for a heat shield to protect one of the bags from the muffler, the heat had already burned a hole through the backside of one bag, and through one of the Tingley slip-over rain boots I was carrying inside. I called Jake to see if he could pick up another pair of boots at his local farm store where I bought this pair, but unfortunately they were fresh out of my Giant size. I taped the hole with duct tape for the time being, and hoped to find another pair before leaving. Otherwise I would pick up a pair in Ohio where I figured there were plenty of farm stores. I eventually decided to forget the saddlebags altogether and use the back of the seat for a small makeshift pack. Eventually I wore the boots for most of the trip to cut down on luggage. I’ve found over the years that it’s more convenient and much less expensive to wear a pair of lightweight athletic hiking shoes as my primary footwear on the trips, and slip the Tingley boots over them whenever they're needed. Most leather boots I've tried are heavy and uncomfortable for walking, especially when they're wet; and I've found that after riding in heavy downpours all day, my feet are still dry inside the lightweight Tingley farm boots. Then at night, I can walk to dinner in comfortable, lightweight hiking shoes rather than slogging along in a heavy pair of wet motorcycle boots. The hiking shoes also dry much quicker if they were to get wet. I replaced the original trials tires on the Dakar with a set of Metzler Tourance dual sport tires that I hoped would go the distance. I planned on stopping at Phil Bourdon’s farm in Wisconsin for a brief visit, but I opted not to send a rear tire there. My custom windshield finally arrived late in the afternoon on the day before we were scheduled to leave. A test ride showed that it didn’t do quite what I had hoped it would, but it did a better job of keeping the wind off of my face and head than any others I tried. I was finally ready to leave on a four-week, 11,000-mile trip with a patched-up pair of rain boots, no saddlebags and a windshield that failed to keep the weather off of me. But I was optimistic and anxious to get underway. Needless to say, without the saddlebags I packed lighter than I originally planned. I called Jim to tell him I was ready, and to give him a few tips on what to carry. This is a list of most of what I wore and carried on the trip, which I also sent to Jim. As we neared our date to leave, Jake decided to ride with us as far as Vintage Days in Ohio. My main interests in Ohio would be a book-signing event for two of my books that the AMA was selling, and to find a Tractor Supply store for a new pair of Tingley boots. Jake and Jim had other interests, mainly the swap meet and chatting with friends from the Ossa and SMOG groups. Jake said he laid out a great two-day course to get there that included several of his favorite back roads through PA, WV and Ohio. Jake and Jim left Jake's home around 8 AM on July 14, 2004. I left around the same time and hooked up with them a few hours later at a pre-arranged rendezvous point in Royal, PA where they were having breakfast. We rode through several thunderstorms on our first day. They were better prepared for the deluges with their newer hi-tech waterproof riding suits. As a result, I got soaked, especially since my once-waterproof riding jacket already had more than 150,000 miles on it, and it was no longer waterproof enough for the type of rainstorms we went through that day. Luckily I was wearing the rain-suit bottoms when I left home, which are much tougher to get into on the road. They also leaked a little through the seam at the crotch. It was also no surprise that my left foot got soaked from the burn-hole in the boot when the duct tape patch didn’t work for long, which was a reminder to find a new pair in Ohio. We reached Clearfield, PA around 5:00 for a total of 385 miles, which was not bad considering the weather, the twisty roads and our relatively late starting time. Jake included what he calls an "obligatory dirt section" through the Allegheny Mountains, which we rode in the rain. We also rode through two strong storms with thunder and lightning crackling and flashing all around us. I never did get around to putting on my rain-gear top, so I felt like a drowned rat by the end of the day. In spite of the thunderstorms, it was a fun ride. The only dry spot on me was the foot inside the Tingley boot without the burn hole. But mainly we arrived safely, and had some laughs afterward while recapping the day’s events. It was cloudy the second day with only a few light showers. We got to the motel in Bellville, Ohio by 6 PM for our planned two-day stay. We rode a lot of Jake's "good stuff" getting there, including many twisty roads through northern West Virginia and the hill country of southeastern Ohio. The ride made our late arrival at the motel totally worthwhile, and it gave us a lot to talk and laugh about that evening. About a month before we left on this trip, Jim had asked for a recommendation of things to carry, which I sent to him. While the three of us were together at the motel having a few beers, Jim asked, “When are we getting into these sardines?” They were on my list for when there is no place open for breakfast. I said, “Not yet, Jim. Why do you ask?” He said, “I was just wondering because I packed 21 cans”, which was one for every day of the trip. Our stay in Ohio was enjoyable for the three of us, each in our own way, although the cost was a little above my usual frugal budget, especially the room rent for three nights at the Ramada for the special-event weekend; and also the nearby steakhouse for dinner, two out of the three nights. But in the end, it was well worth the cost. I had called the AMA earlier to see what they could do for us after I learned from calling a few other motels in the area that they were either fully-booked or cost more than $200 a night. They graciously offered the reservations from a block of discounted rooms they had reserved for VIPs attending Vintage Days. While Jake and Jim were occupied at the swap meet, I managed to locate a Tractor Supply store in Bucyrus that stocked my giant-size Tingley boots, and I bought a new pair. I clocked more than 100 miles searching for them, and had lunch at a small, roadside stand with a picnic table. The book-signing event took place at the AMA tent where two of my books were being sold. The event included luminaries from the past, a few of whom I met before. Turnout was disappointing due to a series of heavy rain showers just prior to and during the signing. The museum people asked me to return the next day, but I declined because Jim and I planned to leave at first light for Alaska. A few hours after Jim and I left in the morning, I lost my prescription sunglasses along the interstate, when they flew out of the pocket of my lightweight jacket. We were running around 80 mph when I felt them go. There was nothing I could do about it, which is only one of the disadvantages of traveling on the interstates. The roar of the wind in my ears also bothered me, which was partially the fault of the new windshield. My left ear was already hurting from it. Jim offered a spare set of earplugs that he was carrying, which made it tolerable. By using the interstate for about half of the day, we were able to cover more than 600 miles. We reached Escanaba, MI near the western end of the Upper Peninsula well before nightfall. The weather was great most of the day with clear skies and warm temperatures, which dropped several degrees along the north shore of Lake Michigan. It was around 55° when we left Escanaba soon after first light. A few miles up the road we entered the Central Time Zone and gained an hour from it. Much of US 2 in that area had a third lane for passing every five miles or so in Michigan, as well as much of the way across Wisconsin and Minnesota. It turned out to be a nice ride. I generally tried to hold the speed to a steady 70 most of the day whenever conditions permitted, although the posted speed limit was less in most areas. The area was sparsely populated with very little traffic of any kind. Due to the hour we gained from the time change, we reached Warroad, MN by mid-afternoon. We pressed on, taking less than a minute through Canadian customs. After about 70 miles of bleak shrub fields in southern Manitoba, I spotted a motel in Steinbach, the first town of any size we came to. We had covered more than 630 miles, most of it on two-lane roads, and we were both getting tired. The weather was nice for most of the day, having warmed up after lunch. We rode through several light rain showers. The wind was strong from the side in some of the open areas. I thought Jim probably wondered if I planned to push that long and hard every day, unless he was having a lot less problem with the crosswinds than I was. Much of my problem on the open prairie at the higher speeds was keeping the lightweight bike steady in the crosswinds. If the tank bag wasn't lashed down tight, it would have been in my lap. The wind throws the little bike around a lot, which adds to fatigue. I was generally happy with the comfort, except when the wind changed the control factor. I learned several things on this trip about traveling long distances with a lightweight that I never experienced earlier with the smaller Honda FT-500 Ascot. Jim never mentioned anything about the 600-mile, non-interstate days being too much, nor did he ever take issue with anything; but that day coming into Steinbach was admittedly a long, tough day, with more than twelve hours of steady riding in the crosswinds – not bad for two old geezers. I was 79, and I think Jim was 70, or close to it. I was also using the bonus time-change hour for riding, rather than resting at the motel. I used it for rest only when the weather was bad, or when I'm over-tired. Jim went in search of a six-pack, which he did every night of the trip to relax and defuse any tensions that might have built up during the day. I ended up drinking more beer on this trip than I have in the past 30 years. It might have also helped to relieve dehydration after some of our long days in the strong winds, although I suppose that's debatable. We learned from the desk clerk that cold beer wasn’t readily available in Steinbach. He drew out a map for Jim with directions on how to find it on the far side of town. We had an early breakfast in Steinbach and a second breakfast around 10:00 in Neepawa, MB, both at McDonald’s. I’ve heard that some readers have said, “This guy likes McDonald’s.” That may be so, especially for breakfast and lunch, but it’s beside the point. The point is, I’d rather ride than eat, especially on long trips, no matter how good the food might be at some of the better cafés or restaurants along the way. I'm sure it's better, but I’d much rather be enjoying the ride than waiting impatiently for a waitress to bring a menu or bring the food, which is especially true when I’m traveling alone where the time I might spend sitting alone in a restaurant is quality time when I'd much rather be riding. We reached the outskirts of Saskatoon around 4 PM where I’ve stayed at least a few times, and I planned for us to stay this time but we were running at least an hour ahead of schedule, so I decided to pass through. After a few miles, the skies in the southwest began to look real bad. When we were about 20 miles out, the crosswinds that we had been getting most of the day suddenly picked up to around 40 mph - and stronger in gusts. I saw a rain squall sweeping across the prairie from the southwest that was headed directly toward us. My first thought was to stop and slip on my rain bottoms, even though it might already be too late. I pulled over onto the shoulder, and after managing to get the bike on the side stand, the wind got much stronger. I realized we were caught there with the storm bearing down on us like an express train. I had difficulty getting the rain pants out of the tank bag, while trying to keep the bike from blowing over at the same time. I managed to get them out, but I had all I could do to hold onto them as they flapped wildly in the wind. As soon as the wind died down enough, I got the rain pants on and we found a small motel a few miles down the road, just before the next strong squall came through. We ate dinner and breakfast at a nearby truck stop. It rained all night and was still raining in the morning – enough to get wet going to and from the restaurant both times. For the first few hours after leaving the motel, we rode through more rain showers. The temperature was in the mid-fifties most of the way across Saskatchewan, but wet. It was cloudy when we reached Alberta. I felt chilly most of the morning from the rain and dampness. It finally began to warm up after we reached TC Rte 16, the main highway that took us the last 30 miles into Edmonton. The skies eventually cleared, and it became a really nice day. The wind died down too as we entered the foothills of the Rockies. We caught a late lunch at McDonald's before leaving Edmonton. About a half-hour later, we turned north on Rte 43, which had been upgraded considerably since the last time I passed through. It was now like a superhighway into Grande Prairie where we stopped for the night around 4:45. We rode another 600+ miles that day. We also gained an hour from a time-zone change, making it one of our earliest stops of the trip at 4:45, but I favored Grande Prairie over Dawson Creek or Fort St. John, due mainly to the lower motel and restaurant prices. We rode through several brief showers that afternoon, although it had warmed up nicely during the day. Grande Prairie is one of several towns along the way that have grown considerably since I passed through in 1977, along with Saskatoon and Whitehorse. We chose a beautiful new motel that just opened. Our room had housekeeping facilities with a mini kitchen and a working fireplace. There was a first-class restaurant in the same building, where we had two whopping 25-oz schooners of Canadian draft beer for each of us, free with the meal. Later that evening, Jim left the room to move the bikes to the rear of the building for better security. He mentioned that he was leaving the door slightly ajar. He was out for less than a minute when I heard a very light tapping at the door. I got up to answer it. The guy seemed surprised when the door opened, like he didn’t expect anyone to be in the room. I assumed that he saw Jim leave, because it was that soon afterward. I didn’t say anything at first. I just stared at him. He said nervously, “Oh, I thought my friend had this room”, but it seemed obvious to me that our room was about to be stripped if no one was there. I said, “Check with the desk”, and I closed the door. It was sprinkling the next morning when we left Grande Prairie, and a lot cooler than any morning so far. But the skies soon cleared and it became a really nice day. We gassed up in Dawson Creek where Jim took a few photos at “Mile Zero”. His first experience with one of the steel bridges on the Alaska Highway with the deep grooves in the direction of travel, came that morning crossing the Peace River Bridge. In Fort St. John, we ran through a cold, zero-visibility fog bank with exceptionally heavy, stop-and-go truck traffic. We lost 20 minutes getting through the heavy traffic and thick fog. I eventually flipped the face shield up, removed my glasses, and rode with bare eyeballs in order to see anything at all. The fog lifted as we left the north end of town, and we started the long, steady climb into the Canadian Rockies where the scenery begins to get spectacular. Some of the mountains still had a heavy snow cover. The 122 miles from Pink Mountain to Fort Nelson has always been rich in wildlife with great scenery all the way. There used to be no services at all along this stretch. We stopped at an A&W Restaurant in Fort Nelson for lunch. Later we spoke briefly with a small group of riders at the canyon descent viewpoint near Stone Mountain. They were headed home to Alberta after having visited Alaska. One of the guys with a Honda ST-1300 complained about the condition of BC Rte 37, which they used for their trip north. He said they were now avoiding it, in spite of the extra time it was taking to go around. I asked how much gravel was left because we intended to return that way. He said, “More than a hundred miles.” I have been using Rte 37, previously known as the Cassiar Highway, since its opening day in 1977, and it has always been one of my all-time-favorites. I’ve gone that way on almost every Alaska trip since, either going north or coming back, or both. After Jim got a few photos at the Stone Mountain pull-off, we rode another 30 miles, and were approaching Toad River in northern BC, when I caught sight of two Stone's sheep on the left shoulder of the road that looked like they were about to cross the highway. We were traveling between 70 and 75 on a straight stretch of road when they suddenly began to cross. They were close together and walking fast, almost running. I could see that their intended path and speed were in a direct collision course with my own. Jim was a quarter-mile behind when I instinctively locked both brakes with no hope of avoiding a collision, because I was already less than 100 feet from impact and there was zero time to do anything but hang on tight with the brakes locked. The bike was fully sideways a split second before the windshield hit the lead sheep's head. The bike whacked the sheep broadside. The force of the collision sent the sheep tumbling down the road as I clung tight to the handlebars and I instinctively pinched my knees and legs tight to the bike to keep from flying off. The speed at impact must have been at least 45 mph with the bike fully sideways and upright. The collision almost high-sided me over the sheep. My left leg was between the bike and the sheep at the same instant the left tank pannier, directly in front of my knee, took the brunt of the impact as it struck the bony area of the sheep’s front shoulder. Fortunately, the pannier, which holds my overnight bag, was a few inches thicker than my knee, and it was fully packed, which helped to save my knee and leg from being crushed. In addition to sending the sheep tumbling, the impact threw the bike back to its original direction, and I suddenly found myself facing forward and still holding the handlebars tight, as it rolled to a stop. The whole incident took only a matter of seconds. In spite of being in a slight daze, even before the wheels stopped turning, I said a prayer of thanksgiving. I could hardly believe I had come through totally unscathed. The net result for me was only a slightly sprained ankle. When the bike finally rolled to a stop, I said another prayer of thanksgiving and tried to comprehend what had just happened. Aside from having a little of the wind knocked out of me, and a slightly sprained ankle, I was sitting quietly on the bike in the middle of my lane, facing forward, with no pain. Feeling something warm and wet on my left ankle broke my trance. I thought as I looked down at my left foot it might be oil because the oil tank is on that side, directly behind the left pannier that got hit. But I noticed it was yellowish, which made me think of the poor sheep – maybe I knocked it out of him. I reached down and put a finger in it, brought it to my nose, and realized it was anti-freeze, which made me think the impact might have ruptured the radiator or the expansion tank; but after removing the side cover, we found that the rubber cap was merely knocked off the expansion tank, causing it to belch out some of the anti-freeze. A small piece from the lip that holds the cap on was broken off, which we could fix temporarily with duct tape. At first it seemed that the bike was almost as fortunate as I was. Meanwhile, the sheep scampered up the rocky incline and stopped on a ledge far above the road. Jim picked up the sheep’s horn that was knocked off, and we could see a bloody socket about two inches deep at its base. We could also see from the road that the missing horn left a bloody spike on the sheep’s head where the horn used to be. 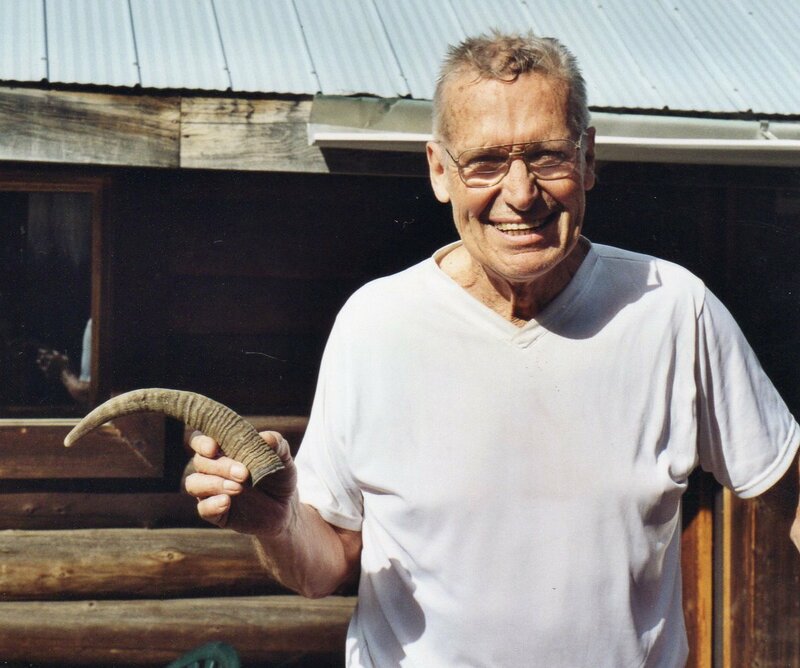 Jim took a picture of the sheep and handed the horn to me. He said with a smile, “Here’s a souvenir for you.” He said the first sign he had that something was happening was when he saw what looked like a huge piece of cardboard tumbling down the road alongside of me, which was actually the sheep. He continued, “and then it suddenly got up and walked away.” Neither of us had any idea what happened to the second sheep. I'm sure he got away totally unscathed. We checked the bike over for other possible damage to see if it was still ride-able. Aside from the shattered windshield and minor damage to the neck of the expansion tank, we noticed also that the headlight unit, which holds the instrument panel, was pushed back a few inches into its mounting, and that it was now too close to the fork legs, causing a steering restriction, although we lacked the tools to do anything about it on the road. The left directional signal was also bent back, the lens was broken, and the mounting screws were torn clear out of the decorative blue cowling that covers the oil tank, but nothing was leaking. We removed and threw away the broken windshield and the side-cover, but not before I took the emblem and other parts that I could use when I install a new side cover after getting home. The final fate of the windshield that I waited 4½ months for, was a healthy toss into the Toad River. The words I said at the time were other than words of praise, but I was still sorry to see it go. I started the bike and took it for a short test ride a few hundred feet up the road and back. It seemed roadworthy enough while going straight, but the steering was severely restricted from the headlight and instrument unit being pushed way too far back into the triple-clamp. But I thought as long as I don’t have to make too many tight left turns between there and Anchorage, I could probably manage by going relatively straight for the next two-and-a-half days. My main concern was riding with no windshield, possibly through many days of cold rain. I thought at the time that I’m getting a little too old for this, and I felt a little helpless for a moment. But I also felt very blessed, and the thought came to me: “The will of God will never take you where the Grace of God will not protect you and carry you through”. I was ready to give it my best shot. I get a great deal of comfort from my belief in a strong, 24/7 relationship with God through the Holy Spirit who I believe is always with me. I've been protected many times in my lifetime, motorcycling and otherwise, and I was ready and willing to take on the bike’s new handicap with confidence. After working on it at the roadside for about 45 minutes, including the test ride, we got underway with hopes of reaching Anchorage, 2½ days away, without too many more serious challenges. As I began to increase the speed, I gradually gained confidence that there was nothing else seriously wrong that I needed to be concerned about. But about a mile down the road I noticed a red warning light on the instrument panel flashing. I was unable to see well enough to recognize the icon, so I stopped to ask Jim to take a look. He said it was the temperature warning light, which wasn’t the greatest of surprises. It was obvious earlier that the expansion tank probably needed refilling. Nothing was leaking. We looked around for water and fortunately there was a pond with clean water nearby. Jim was able to use one of his thin plastic rain booties to carry a boot-full from the pond. After refilling the expansion tank and rechecking the cooling system for leaks, we continued on our way. Another 15 miles down the road we were stopped by a female flag-person at the start of about 10 miles of road construction east of Muncho Lake, where a pilot car was in use. We were the first in line to wait for it to return from the other end of the construction area. There was practically no traffic on the road. The pickup that was being used as a pilot car arrived a few minutes later, driven by another girl. We talked briefly with the pilot-car driver and the girl holding the traffic-control sign during the few minutes we waited. One of the girls noticed the sheep’s horn tied to my luggage, and after listening to some of our conversation, she asked if the sheep had gotten killed. Jim said jokingly, “No, but he must have had one hell of a headache.” She said, "I wouldn't try getting that thing through customs. If you were ever caught with it, you would be in big trouble. The Stone’s sheep are a protected species." The other girl smiled and said she thought it was worth a try. She suggested that I could always claim I found it along the road and that I’m an innocent grandfather and planned on giving it to one of my grandchildren. Eventually I tossed it into the woods. I felt that I had enough to worry about without tempting more – but not before I posed for a photo with it. I asked the girls about motels at Muncho Lake, and specifically about the Muncho Lake Lodge where I stopped with the RAMS in 1991. One of the girls said the lodge was no longer there. She said there was a small motel at this end of the lake that was by far the most reasonable in the area. We got to the motel around 4:30 to find that it was a real dump inside, but we stayed there anyway. It was a rustic old four-unit motel with no locks on the doors; the beds were old and swaybacked; the thin army-type mattresses were filled with lumpy cotton batting; the cot and bedding were badly worn and tattered; the small bathroom was old and smelly; the toilet tank was leaking; and the entire commode unit was loose from the floor. It ranked as the worst accommodations we had on the trip. They still charged quite a bit because of its beautiful location. I doubted that the girl who suggested it had ever been inside the place. The outside didn’t look nearly that bad. I think we were the only occupants in the motel that night. Our choice for dinner was either to eat Danish pastry, probably stale, from the lobby with sardines to go with it, or go a few miles up the road to a new lodge for a decent meal, which we did. The place was new and beautiful with a huge cathedral ceiling, built entirely with logs. I think it was located on the exact spot as the Muncho Lake Lodge where we stayed in 1991. We both chose Weiner Schnitzel from the menu. The bill, which included a few beers, came to $85 between us. The price was actually not that bad, because the restaurant was first class for the area and the food was quite good, as was the Canadian beer. The prices were in Canadian dollars too, which was to our advantage at the time. The dinner was a celebration for my having coming through the unforgettable experience totally unscathed. I felt very fortunate for never having hit an animal of any kind in more than a million miles of motorcycling. I’ve come very close to deer several times, and to dogs and other animals, but this was the first time I actually hit one. And I survived without a scratch. Considering the speed I was traveling, the size of the animal, and the fact that I was not thrown from the bike was unbelievable. The possible consequences at my age are scary to think about, especially with the blood-thinning medication that I’m on. When I looked into my overnight case that night, I was shocked to find how much of the contents were crushed from the sheep's shoulder. The inside was a mess with ink, toothpaste, shampoo, broken pieces of plastic and other miscellaneous stuff intermingled with many loose pills. I was able to salvage most of the pills, which were mainly vitamins from a crushed plastic bottle. I cleaned the inside of the case and repacked it that evening. Jim named off several animals he saw during the day, including bear, elk, caribou, at least a few dozen sheep of different varieties and a few other animals. I woke up at 3:30 and my mind went into high gear from thinking about the windshield. I concluded the best thing to do was call Cliff’s BMW in Danbury, CT in the morning and ask them to overnight the Cee Bailey shield that I returned months earlier, and send it to the BMW shop in Anchorage, so I might at least have weather protection for my torso during our return trip. I knew from testing the windshield earlier that the shape and the mounting directed a strong current of air to my shoulders, face and head, but I figured I could handle that with the full-face helmet. I decided to call Danbury rather than call home for the small original windshield, because I wasn’t ready to break the news of my encounter with the sheep to my family. Every part of my body ached when we got up at 5:15. My left ankle hurt from the impact, and my lower back hurt from arthritis and spinal stenosis, especially after that night on the awful bed and mattress. I didn’t get much sleep. We had sardines and juice for breakfast because the nearest place for something better at that hour was 170 miles away in Watson Lake. I called Danbury at 6:30 local time from a pay phone on the wall outside the motel, which would be 9:30 Danbury time, on a Saturday. It was a beautiful day, although the temperature was in the mid 40s when we left. There was barely a cloud in the sky until mid-afternoon. I felt very fortunate to be alive, and I gave thanks to God again for my being totally uninjured, as well as for the beautiful day. It felt comfortable enough without a windshield. It reminded me of being in an enduro. A few hours later, not far from Watson Lake, we came upon a herd of about thirty bison spread out on the highway. The huge dominant male stood stubbornly in the middle of the road as I picked my way through the herd. As I passed closely by him, he looked like he was letting me know that he meant to protect his herd. I wouldn’t want to collide with the likes of him at any speed. I believe some species of animals would have reacted unkindly to the way we rode through. But this one just stared at me without moving a muscle, except for his huge angry-looking eyeball, which followed me as I rode slowly by. It seemed like he was saying, “Don’t tempt me, old man!” I think if it had been a female moose with newborn, which I understand can be very nasty when they feel that their young are threatened, it might have been different. We saw a lot of smoke coming from a forest fire in the same general area. I think the fire had been burning for weeks by that time. I have no idea how much effort was being used to put it out – sometimes very little. We got gas and a stand-up breakfast at a convenience store in Watson Lake. Before leaving town, we visited Signpost Park, which has been a tourist attraction ever since the accumulation of road signs began during the construction of the Alcan Highway in 1942. Families of WWII servicemen assigned to the construction project used to send signs from their hometowns to remind the guys of home. The area later became a famous park that has grown steadily since it all began. To this day, people still send or drop off signs of all shapes and sizes, including the names of their towns, route numbers, speed-limit signs, pedestrian crossing signs, etc. When I first came through in 1977, it looked like about an acre of signs. The park has grown since to almost 20 acres. I survived the first full-day better than I thought I would without a windshield. It bothered me a little at first as we rode our usual 70 mph most of the day, but I got used to the strong wind pressure and the louder sound. Another thing that bothered me was the accumulation of splattered bugs against my face shield, which would eventually cover it entirely. Whenever we stopped for gas I would use their windshield-washing tool with soapy water to clean it. Since it was a clear day, I was able to tolerate the wind, and I thought I could have easily ridden the entire trip to Anchorage and back without a windshield, as long as we didn’t get too much cold rain. All day in bad weather would certainly dampen the joy. We got to Teslin around 1:00. I wondered how my narrow, 21” front tire would react in the deep grooves. It actually did well. The excellent handling machine just weaved gently side to side in the grooves while we maintained a steady 70 mph. Since the bridge is relatively narrow, the posted speed limit is much less, which would be scarier with a bike than riding fast. Jim was more shook-up earlier by the Peace River Bridge where we traveled slowly. Just beyond the bridge, we pulled into a combined gas station and grocery store. While getting gas, I suggested that we pick up a sandwich for lunch. I had totally forgotten about the steering restriction from the headlight being pushed too far back. While I was maneuvering to get closer to the store, I committed my balance to a tighter turn than the newly acquired restriction would allow, and I suddenly dropped the bike in front of the store. The next thing I knew I was lying on the ground with a leg underneath. Everything happened so fast! It was like Arte Johnson in the old TV show, “Laugh-in.” Fortunately, I didn’t break a hip. Several people came running from all directions to lift the bike off of me. A few men came running from inside the store and flew off the porch without using the steps. Jim said his first thought when he looked over and saw me on the ground was that I had a heart attack. The right-side pannier took most of the hit this time – and it was my right leg that was protected by it. A tin of sardines in the bag ruptured and created a smelly mess inside. I cleaned it out that night and washed everything, including the bag, but I could still smell sardines months afterward. We got to Whitehorse, capital of the Yukon Territory, less than two hours after that late lunch. It was just beginning to rain. We got a room on the highway rather than going into town. The center of Whitehorse has mostly higher-class hotels and motels, whereas the old travel motels along the highway are still reasonably priced, and they're not bad. Whitehorse seems to have grown tenfold since my first visit. We checked into the motel early, partly because we were several hours ahead of my original schedule, and partly because there was no need to press on in the rain without a windshield. It also gave us time to see if there was something we could do to improve the steering before I fell again. After dinner I lubed the chain and tried to come up with ideas. Jim found a 3-foot piece of two-by-four to hold the forks steady while I gave the handlebars a jerk, which forced the headlight unit forward. In short, we fixed the problem permanently in less than a minute. We left Whitehorse at 6:45 AM with temperatures in the high forties. It was one of our coldest mornings so far, although we carried plenty of winter clothes for it. The next sizable pocket of civilization, where I planned to stop for gas, was Haines Junction, about 95 miles west of Whitehorse. We were about 20 miles from it when we rode through another cold fogbank. For the next ten miles I had to ride with bare eyeballs again, and this time it was with no windshield. I could barely see well enough to hold the speed we were traveling and still feel safe. We passed through one of the normally colder regions of the Yukon just west of Haines Junction during a light rain shower. It rained again as we approached Beaver Creek, the last section of the Alaska Highway in the Yukon before crossing the border into Alaska, which is normally a cold area that has been a challenge for travelers for decades due to extensive frost damage. Much of the road surface was broken-up, as it almost always gets when the ground thaws in the spring. Both of our bikes were covered with mud, which was also getting splattered on the back and front of my jacket as well as my face shield. Visibility was very poor. One section of the highway in the Beaver Creek area was closed for resurfacing with plastic pylons placed side-by-side across the road to block traffic. There was a detour sign just before the pylons directing traffic to a temporary gravel road alongside the highway. I didn’t see any of it until I was only 25 feet from the pylons and I was approaching fresh soft dirt, loose gravel and who knows what-all at 70 mph. I hit the brakes too hard at first, causing the bike to swing sideways. Fortunately my reflexes cut in soon enough to keep from losing it, and I controlled it enough to guide it between the pylons and ride it out on soft freshly bulldozed dirt. My forward motion finally stopped almost two hundred feet from where I first spotted the pylons. Jim had been watching all of it, and he said later that I sailed through the pylons in a partial slide like threading a needle. Thanks to the superb handling of the Dakar, I was able to regain control and get safely onto the temporary road where Jim was already riding. It was the third day in a row that I had a close call, which led to some serious self-reflection. It was still raining when we reached Kluane National Park, a beautiful area in the western Yukon where I had intended to stop so Jim could get some photos, but I didn’t because of the rain. Due to very light traffic and not stopping as often as I had planned, we built up another hour ahead of my schedule, bringing us into Tok about three hours earlier than I originally expected. My original plan was to make it our overnight stopover because of the relatively low prices, but we stopped only for a quick lunch at Young’s Café on the corner where I’ve stopped often in the past. We decided at lunch to press on for Glennallen in spite of the meager choice of motels there. I hoped there would be competition enough by this time to bring the prices down; but the Caribou was still the only game in town, and their lowest rate was now $135. I inquired at the tourist center for an alternative, and they suggested Tolsona Lake Resort, about 25 miles farther west. I had seen signs for the place on earlier trips, but never stopped. We located it about a half-mile off the Glenn Highway, only to learn that they too, probably taking advantage of the monopoly of sorts in the area, were asking $125, and the place wasn’t nearly as nice as the Caribou. By bargaining for a senior discount I got the woman down to $100, but the room was a dump, second only to the small motel we stayed in at Muncho Lake. There was a reasonably nice dining room in the lodge, with a bar, so we had a few beers first, and dinner later in the dining room. The dinner was okay but also expensive, and this time it was US dollars. One of the TV channels was running a “skin flick”, so Jim didn’t consider it a total loss. We got up at our regular time and left around 6 AM in a light drizzle after sharing a tin of sardines in the room. I didn't see any signs of a place for breakfast at that hour. We ran into road construction less than ten miles past Eureka Summit where it was still drizzling. We had to wait about a half-hour for the pilot car to return from the other end. As soon as it arrived, it turned around and led us through many miles of road construction with huge piles of rocks and idle earth-moving equipment to the other end near Matanuska Glacier. Ten years earlier, the area had almost a hundred miles of great, twisty, two-lane blacktop from Eureka Summit to Palmer. It was along that section, during one of my earlier trips with a Gold Wing, that I experienced a strong earthquake that loosened rocks that came tumbling down from the canyon walls onto the road. The construction crews have been cutting away huge sections of the mountain for years to straighten and modernize the highway, which will eventually be upgraded to modern standards for about 180 miles. We got to Palmer around 10 AM and stopped for breakfast at the same McDonald’s I’ve used on several trips, after which we rode the final 43 miles into Anchorage with clear skies and mild temperatures. We arrived at Rey and Becky’s home around 11 AM on Sunday, July 25th, eleven days after leaving New York, and 7½ days after leaving Ohio. We averaged roughly 550 miles per day. Rey and my grandson Robyn expected us, and they were waiting, as were two of Rey and Becky’s children. My granddaughter Asia was still at church while Becky and her other two children were helping out at a friend’s home. We were having a snack on the patio when Asia arrived around noon from church. She and Robyn are the oldest of my ten grandchildren. Becky had set up sleeping accommodations for us in their home. They gave up their own bed and bedroom for me, and they graciously fed us for two days while we rested, cleaned up and regained some of our strength. That night we were treated to deep-fried halibut and chicken with beer batter, all of which Rey prepared. He once worked as the head party chef at Elmendorf Air Force Base officer’s club, and he was a very good cook. On Monday, following breakfast, Jim and I visited the BMW shop to see if my windshield had arrived from Danbury and to visit with my friend Don Rosene. The windshield was there and I installed it, only to learn for a second time, after a brief test ride, that it was just as ineffective as I remembered. I can’t imagine what size rider it was designed for. It certainly didn’t fit me, and I didn’t have the time, tools or materials to modify the brackets and change the angle enough to make it effective. I realized that it would have been much better to have called home and asked my son to send the original small windshield that came with the bike. At least with the original, the wind only hit the top of my helmet. I soon learned that riding with that windshield was worse than riding with no windshield at all, especially after getting used to having one. It created a strong current of air that spilled off the top directly onto my face, head and shoulders. The only good thing I could say about it was that it kept the wind and rain off my tank bag. But now that I had it, my only options were to keep it and use it, or remove it and leave it there; and then continue to ride with no windshield at all for the rest of the trip. I decided I couldn’t depend on the weather cooperating all the way home, and it would at least keep the rain off of my lower torso and tank bag. I decided to keep it and put up with the strong wind current for the rest of the trip. I got a stiff neck the first day out of Anchorage from bracing my head against the strong wind current at a steady 70 mph. It finally found a home a few months later when Jim bought a BMW F650GS and I gave it to him. He designed a different set of brackets for it and he was happy with it. We got up around five on Tuesday and came out to the kitchen to find our hosts already up and fixing breakfast for our send-off. Rey and Becky were gracious hosts during our entire visit. We were on the road by 6:20. I lost some of that advantage by missing a turn leaving Anchorage due to my eyesight. I missed another turn a short while later where road construction changed the approach to Palmer, and we were in Wasilla before I realized it. Finding our way back to the Glenn Highway took even more time because I was unfamiliar with the roads. We still arrived at the entrance to Matanuska Glacier 15 minutes before it opened for the day, although the attendants at the entrance allowed us to pay and enter early. Being alone in the park enabled us to get much closer to the glacier with the bikes than we normally would have, which saved a lot of walking. We picked our way along a rough, rocky foot trail with the bikes for almost two miles before parking and walked another 100 yards to the end of the glacier where we climbed onto the ice. The glacier had receded a few miles since my last visit in the early 1980s. After a few photos, we returned to the Glenn Highway and arrived just in time to slip in at the head of the line between the pilot car and a huge string of cars, trucks and RVs to go through the construction. The pilot car left immediately, and led us to the same spot near Eureka Summit where we waited two days earlier. We had an early lunch in Glennallen and stopped for the day around 2:00 in Tok. Early the next morning we turned northeast on the Taylor Highway toward the Top of the World Road and Dawson City in the Yukon, stopping only briefly for photos at the old Jack Wade Gold Dredge that had sat idle in Bonanza Creek for almost a half-century. It ceased operations in 1960, and I learned later that not long after our visit, it was dismantled and sold for scrap. It was raining before we reached Chicken, AK. Unfortunately the weather continued to be lousy all the way across the Top of the World Road, which was especially disappointing because it was one of the scenic highlights. We rode through at least two heavy downpours and thick fog for the last 45 miles to the Yukon River. It was almost impossible to see the road in a few spots, but we pressed on, often feeling our way in zero-visibility fog at speeds below 30 mph. I almost ran into the back end of a huge highway dump truck in the fog. We were traveling less than 30 then. We got to the Yukon River with a few minutes to spare before the ferry arrived. It quickly unloaded and reloaded, and took us across the fast-moving river to Dawson City. We were the only vehicles aboard. We stopped at a convenience store in Dawson City where we got gas. We shared the last ham and cheese sandwich from the cooler before heading for Carmacks, which was a rough 225-mile ride on the Klondike Highway. We ate on the run because we had to make it to Carmacks that afternoon. We had already lost so much time to the weather, and I knew of no other motel along the route. I was expecting a tough ride on the slippery gravel. It rained steady, practically all the way, sometimes heavy, which created many muddy spots. At our gas stop in Pelly Crossing, we met a couple from Ontario riding together on a BMW R1150GS. They were headed for Inuvik via the Dempster Highway. 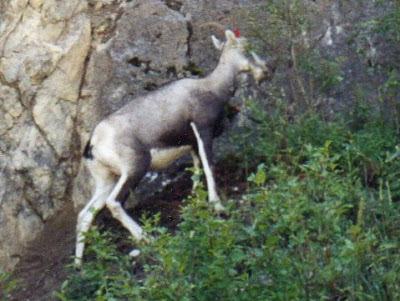 They said they heard of a biker hitting a sheep on the Alaska Highway a week earlier. News like that travels fast. I assumed they heard it from the girls that we talked with at the road construction near Muncho Lake. The weather eased as we left Pelly Crossing, but not for long. It poured again for the last ten miles into Carmacks. The wet, slick gravel roads, and the distance, made it one of our toughest days of the trip so far. The inadequate protection of the windshield made it even tougher. We got in around 4:30, having lost two hours to the time-zone change. I was happy to find a motel in Carmacks with a restaurant nearby, and even happier to learn that we arrived minutes before they sold the last room, which was a huge relief. I was exhausted from the 415 miles of rain, fog and soft, loose gravel with poor weather protection. I’m sure I couldn’t have gone much farther. The crotch of my jeans under my rain suit was soaked for only the second time on the trip. The only part of me that stayed dry was my feet inside the Tingley boots. I hung the wet jeans in front of a fan in the room, and left it on low all night. After a quick breakfast, we headed down the seldom-used south end of the Campbell Highway, which was gravel with a very slick surface. It was the only piece of road on the trip that I had never ridden. We were about 15 miles into it, riding in a steady light rain, when I began to get a thin splattering of mud from the front wheel directly onto my face shield. It got so bad that it was almost impossible to see through it. I wasn’t wearing glasses at the time because they cut down even more on the light. We didn’t realize how slick it was until we stopped to work on the problem, and we had difficulty maintaining our footing on the road surface. It felt and acted like wet clay. We quickly fashioned a mud flap for the leading edge of the front fender from a small piece of plastic that Jim found alongside the road. We used duct tape to attach it to the fender. I cleaned the face shield as best I could with water from a clear puddle in the road. I was totally covered with mud. The superb handling of the bike helped me to get back up to 70 mph quickly on the slick surface. I noticed in my rear-view mirror that Jim lay back a little at first, until he mastered the handling of his big 1150GS on the slipperiness, and he was soon keeping the pace. It rained on and off for the entire 375 miles on the Campbell Highway that morning, almost all of which had the same slippery surface. We had to go about six miles off the main road into Ross River to refuel. It took several minutes to find a gas pump that was outside an old repair garage on a side street. The 176 miles from there to Watson Lake took almost five hours of continuous riding on the same slick surface, which included a long muddy construction area. I stopped once in the middle of the road around noon to catch a breath. Jim broke out a tin of sardines while I munched on a granola bar. We stood quietly eating in the rain, too exhausted to speak. We got to Watson Lake at 2:30 and had another light snack at the gas station, which served as the second half of our lunch. My plan for the day was to reach Dease Lake, which was still at least three hours away, bringing our daily total to 530 miles of mostly very muddy gravel. I was tempted to call it a day in Watson Lake, but it would have complicated accommodations for the next few days, so we chose to press on. Hwy 37, the Cassiar Highway, was not nearly up to the same maintenance level as the Alaska Highway, and the speed limit was mostly 45 and 50 mph, with less in the construction areas. Most of the surface was uneven, and there were several twisty sections with no centerlines, making it tricky to maintain the speeds I chose to ride with any degree of confidence, but we managed to hold 65 and 70 most of the way, except where workers were present. We arrived in Dease Lake around 5:45. My original target was 5:00. I had hoped to give Jim a day on the gravel he would long remember, and I think this one qualified. It was dual sporting at its finest, albeit a little more than I had planned for. I recalled what the guys from Alberta that we chatted with earlier on the Alaska Highway said about the Cassiar Highway. I can see why they weren’t too complementary. We were really tired when we finally got to the room that night. I was glad Jim was able to find a six-pack – maybe more-so than any other time on the trip, so far. It was a long, tough day for both of us, and probably our toughest riding day. The last two days would have been a worthy challenge for someone half our ages. That evening I realized that the mud had practically destroyed the chain. The bottom rung was hanging much farther down than it would normally have been on a single day, even considering the wet gravel. It was obvious the chain was on its last gasp. I had been lubing it every night, but that day on the muddy roads in the rain was more than it could take. My last glimmer of hope for it going the distance was fading fast. If the bike was equipped with a center stand, I would have lubed it several times during the day, but without the stand, it took several minutes each time; and I let it go far too long, due mainly to our time constraints and the thought of having to push it every time in the mud and heavy rain to lube it properly. I soaked it with lube at the motel and readjusted it, but it didn’t hold the adjustment for long. I was beginning to feel the strain of the growing number of issues. Having been in similar situations a few times with others, I made a special effort to stay as calm and nonchalant as I could, in spite of the problems, so as not to affect Jim, and involve him in my problems. I certainly didn’t want to mess up the excellent relationship we had during the trip. A word about Jim at this point: From the onset, I could tell that he had read my first book. He did just about everything my way. He was an excellent riding partner for the entire 25 days. Every time I looked in my rear view mirror, I knew he would be there, even when my speed would inadvertently creep up over 80 mph on roads that one wouldn’t normally travel nearly that fast, especially the Campbell Highway with its surface like wet clay. He was as agreeable as he could be with everything, whether it was where we ate, where we slept, what time we got up in the morning, how fast we got underway in the morning, how many miles we made in a day, or how late in the day we began to look for a motel. He never complained or took issue with anything. He even ate sardines for breakfast, and occasionally for lunch. In the past, whenever I went on a trip with anyone, I was usually the first to have the bike loaded and running in the morning and the first to finish eating at almost every meal. On this trip, I was the last at just about everything. I've seldom seen anyone who can pack his bags and load a bike as quickly as Jim, and I’ve never known anyone to eat faster. He would let me make all of the decisions, and he’d be agreeable with everything. He never showed a bit of displeasure with anything I decided to do. He would even ask what kind of beer I would like before going out for a six-pack! How could anyone find displeasure with Jim Hoellerich as a riding partner? I certainly never did, and I certainly wouldn’t want to do anything to mess it up. I’m sure some of my idiosyncrasies must have annoyed him – at least some of the time, but he never showed it. We left Dease Lake before 6:00 after sardines in the room again, since there was no place open for breakfast and we had 550 miles to go that day to get back to civilization. The temperature was in the low forties at the motel, and it dipped to the 30s at the higher elevations. There were only a few short gravel sections left on the original Cassiar Highway, and much of that was covered with marble-shaped gravel. One of those loose-gravel sections started halfway around a wide curve from smooth blacktop. I went into it much too fast. Both wheels began to break loose as soon as they hit the gravel. Jim also slid, but we got through without incident. My face shield was beginning to get much more difficult to see through from having been hit with so much muddy water, and by wiping smashed bugs off of it. Sometimes I wiped the face shield without thinking first, which would smear it. I also stopped to check the chain more often that day. At one of those stops, I saw that it was looped down way too far again, after only a few hours of riding. I began to get preoccupied with where I might find the replacement. I was sure by then that it would never last to New York, and I was beginning to doubt it would last to Phil Bourdon's farm. Soon after reaching TC16, we ran through more road construction that cut considerably into our time. We were still able to cover 540 miles that day despite the problems, the messy dirt sections, and the extra stops to lube the chain. We stopped at a motel in Vanderhoof around 5:45 after a long, stressful day. Normally I would have stopped for photos of scenery along the Cassiar, but I was stressed out, over-tired, and too preoccupied with the chain to give much thought to photos. I was able to clean the mud from the radiator core with a high-pressure hose that was already hooked up in the motel parking lot. Fortunately we came through the last of the rough, muddy roads, and we should have clear sailing from here to the east coast. We spoke with a biker at the motel who had just ridden in from Richmond Heights, WA, having passed through Wenatchee on the way. He traveled the exact reverse of the route I originally planned to take into the US on this trip, but I had since revised it in favor of a more scenic route through the North Cascades, which I used at least a few times in the past. I thought Jim would appreciate the scenery, even though it added extra miles to the chain. I figured I’d have to get a new one somewhere, and I supposed one route was as good as another for finding one. The temperature was in the low 40s when we left Vanderhoof at 6:30, riding into the bright early-morning sun. I rode for at least an hour without glasses, with the face shield flipped up. I knew I would have to ride that way practically every morning until we got home. One way to avoid the early-morning sun-glare is to leave a few hours later in the day, but it means spending extra time on the road in the afternoon heat to make the same number of miles. That day turned out to be one of my worst of the trip in several ways - my scuffed up face shield, the strong current of air in my eyes, the sagging chain, and a rear tire that was going bald faster than I had expected. The bike’s handling was also getting worse every day due to a bind in the steering head bearings. It was far too soon for head bearings to fail on a new bike, but I’ve experienced early head bearing failures on other BMWs that I’ve had, and I’ve known others with similar problems. It got hot as we descended from the higher elevations into the desert-like terrain around Cache Creek, BC. We stopped for lunch at a Subway. It got even hotter after entering the scenic Fraser River Canyon where the traffic was heavy. I had been passing cars, trucks and RVs as we got to them most of the day. I continued to hold mostly 70 mph on the two-lane highways. At one point in the canyon, I hesitated behind the last car in a long string of cars, trucks and campers, and waited a few moments for a safe spot to pass them all at once. As soon as we got to a long, straight stretch with no one coming the other way, I peeled the throttle on and started to pass the entire string about 10 feet before the end of the double-yellow line. It was just before almost a mile straight stretch with a single dotted line and no one coming. It looked plenty safe. The problem was the first car that I passed was an unmarked police cruiser; and since I pulled out about 10 feet too soon, he flipped on the red flashing lights behind his grill and took off in hot pursuit before I was even past his front fender. There was no talking to this guy. I ended up with a $109 ticket for crossing the very end of the double-yellow line in what I considered to be a perfectly safe move, but it cut no ice with him. Jim offered later that if I were to spread that $109 over all of the cars, trucks and campers I passed on double-yellow during the trip, it would probably average out to about a nickel each. It wasn’t the end of my bad streak for the day, which hit its nadir in Abbotsford. We had been riding along TC1 as I looked for the cut-off for Rte 11 to the US border. I couldn’t read most of the tiny Canadian route markings, so I guessed at an exit and took it. I saw a sign for gas and figured we’d get gas and directions at the same time. The gas station was out of gas, but I asked the female attendant for directions. She said we weren’t far off, and she directed us via a few back roads to find the Rte 11 entry ramp. She said it was less than a mile, and it would be much easier than going back out on the highway. I got there quickly but I missing the turn for the entry ramp, so I made a U-turn to go back for it. Jim was behind me when I made the initial U-turn, but I made the turn onto the entry ramp while he was still finishing his U-turn, so he didn’t see me take the ramp. I stopped partway up the ramp to look back, only to see him fly by. I then made a U-turn on the one-way ramp to go after him, but he was already out of sight. I saw a gas station on the left side of the four-lane city street and figured rather than chase him, I would turn into the gas station and wait for him to come back, since he’d most likely return to where he last saw me. I checked both ways before making the left turn into the gas station, which was across two empty, oncoming urban traffic lanes. But an SUV came very fast over the crest of the hill from the opposite direction when I was partway across the on-coming lane. He locked up and there was a loud screech of tires as the guy hit his brakes hard and swerved to avoid hitting me. It was the closest call I had in traffic on the entire trip. It wasn't my fault but it shook me up almost as much as the sheep incident. It made me think about the awful things that can happen in the blink of an eye. It’s a blessing to have an ongoing 24/7 interaction with the Holy Spirit, and to believe. Jim appeared as soon as I pulled into the gas station. I was still rattled from the near miss while we got gas. Later, while riding south on Rte 11, I saw a sign that said the border was only two miles from there, whereas my route sheet said it was 126 miles; so we gained more than 2 hours from that route sheet error. It seemed like so many things were going wrong that day, but at least this error was in our favor. We stopped at Canadian customs to ask for a form to recover the tax we paid on motel bills in Canada. The customs guy told us to get it at the duty-free shop, which was at least a few hundred foot walk, and he wanted us to fill out the forms there. After a few minutes arguing with him on how ridiculous that sounded, he finally handed us the forms to take with us, which is what I asked for in the first place. We then cleared US customs quickly and rode for another hour into Burlington, WA, but not before a few more wrong turns and getting mired in Friday night rush-hour traffic. We checked into a motel at the intersection of Rte 20 and I-5. As might be expected, the air conditioner didn’t work and it was hot and muggy that night, which seemed like a fitting end to a really lousy day. The chain also needed another major adjustment. It was obvious that it would never make Phil Bourdon’s, which I had been hoping for. It was a very trying 12-hour day with brutal heat from about noon on; although things began to look a little better after Jim got back with the daily six-pack, but not much. I originally planned to meet my friends from California in Wenatchee the following day, and ride with them to Montana. But I got word that evening, relayed through Barbara at home, that they were already in Missoula, and that they would rather we meet there. Had I known earlier, I would have taken a different and more scenic route through Canada into Montana, in which case much of that worst day might never have happened. Early the next morning we rode 40 miles through alternate patches of cold thick ground fog and bright sunlight. I rode with bare eyeballs for at least an hour until we began to climb into the North Cascades. We stopped for photos at Diablo Canyon and again at Diablo Lake before reaching Winthrop around 11 AM, where we stopped briefly for gas and a snack. The town was filled with motorcycles. We reached Wenatchee around noon and decided to call it a day, which was on my schedule since I planned to spend part of the day there with my friends. The temperature was in the high 90s. It would have been a good spot to find a bike shop for a new chain, but the temperature was in the mid-90s and I was exhausted. I managed to contact the guys and arranged to meet them at the Days Inn in Missoula the following day. I revised our route in the morning to avoid the gravel roads that I originally planned to take over St. Joe Pass into Montana because the chain had already taken about all the gravel roads it could handle for one trip. We headed for Missoula on paved roads that I was also familiar with. We took a side-trip to the Grand Coulee Dam, and were still able to reach the Days Inn in Missoula by 3:00. My friends pulled in the parking lot around 5:45. Jim and I already had our six-pack, and were resting. Jim Bellach and John Dey came by our room after freshening up from their ride. Jim Bellach and I began communicating after he learned from my first book that we had mutual friends in enduro competition, and other things in common. This was the first time we met. He brought a gracious gift of California raisins and almonds from his and his brother's farms. After introductions and quality time getting acquainted, we walked to a nearby restaurant to continue talking over dinner. John insisted on picking up the total tab, after which we returned to the room for more conversation and bonding. When they left, they said they decided not to ride with us in the morning, but we did vow to meet again for a ride together somewhere in the not-too-distant future. Jim and I were up at 4:45 for one of our earliest starts of the trip. The complementary breakfast was ready early, so we were on the road shortly after six, having eaten enough breakfast from the buffet to preclude stopping. It began to rain when we got out to the bikes, so we suited up in the parking lot and left in full rain gear. We used I-90 for about 75 miles before the weather cleared and got warmer. We turned south on Rte 212 and stopped for gas in Red Lodge before beginning the long and beautiful climb on the Beartooth Highway through a series of switchbacks to Beartooth Pass at 11,947 ft. That 50-mile ride from Red Lodge to the top was the scenic highlight of our trip. It’s considered by many to be the most spectacular ride in the USA. The Dakar handled very poorly on the way up due to worn head bearings, which had been getting worse and took some of the enjoyment from the ride. Every time I turned the handlebars even slightly, coming into or out of a turn, the defect would first try to hold the forks straight, and then suddenly break loose, causing a unnerving jerk in the steering. It was windy, rainy and cool at the summit with patches of snow in some spots. Jim took many photos, probably more than any other place on the trip. We turned southeast on WY 296 and rode most of the 62-mile descent to Cody on the Chief Joseph Scenic Highway. We skipped a shortcut that I planned partway down the mountain because of the deteriorating condition of the chain, the head bearings and the rear tire. They all had as much as they could take of gravel roads for one trip. We were delayed along the Chief Joseph Highway by more than a hundred head of cattle being driven down the middle of the road by a group of cowboys on horseback. They were holding up a long string of cars and campers. After about 15 minutes of painfully slow riding, an impatient car driver began to squeeze by the cattle on the right shoulder. Jim and I followed, and we got through long before we would have otherwise. Upon reaching Cody, we turned onto WY Rte 14A and rode for about 25 miles to Powell where we found a motel just as the sky was beginning to darken. The temperature was in the sixties when we left Powell in the morning. It dropped another 10° per hour as we entered the Bighorn National Forest where the climb was steep and twisty, and the scenery was spectacular. We saw large herds of cattle grazing at the higher elevations. After reaching I-90 near Sheridan, I noticed that many of the ore trucks were running 80 mph and faster. As much as I was tempted to run with them, I didn’t think it would be prudent to travel at those speeds with the chain and rear tire the way they were. I held it down to 70, which was still risky. From the time we got onto the interstate we saw many motorcycles apparently heading for the bike rally at Sturgis, even though the start of festivities was still five days away. All of the campgrounds around Sturgis appeared to be filled to capacity. We ran through a few light showers around midday and pulled over to suit-up but we soon ran out of it, and we rode across hundreds of miles of South Dakota flatlands in bright warm sunshine. The chain began to make awful sounds near Chamberlain, SD, like it might not last another mile. I pulled into a rest area to see if there was anything I could do for it. It had more slack than ever. Even after taking up the last of the available adjustment, there was still far too much slack. It was obvious that it wouldn't last for another 10 miles, and we were still 550 miles from Phil’s where I planned to get the replacement. There was a travel center at the rest area where I asked about motels and bike shops. The woman gave directions for a few motels in town and also to a Honda quad dealer who she was quite sure worked on motorcycles. I figured he should have some kind of chain to fit, and I could deal with the sprockets later. We decided to make it our overnight stop since it was already 6:00 and well past when I should be dealing with it. We went first to the quad dealer and caught him just before his closing time at 6 PM. I asked about a chain and if he would consider staying open long enough to install it. He had the size but only in the non O-ring type, which would have to do, under the circumstances. The mechanic proceeded to grind the links to get the old chain off and install the new one. I assumed it was new, although it wasn't in a box, and it didn’t have a master link with it, which should have raised a flag for me. He searched around and found a removable clip-type link that seemed to fit, although he had difficulty installing the clip. Seeing him struggle with it, I should have known it might be the wrong link for the chain, or the wrong clip for the link. But neither Jim nor I gave it a thought as we were chatting with the owner and a few of the employees about our trip, when I should have been watching the mechanic closer. Parts and labor came to around $100 and I tipped the mechanic for staying overtime to work on it. After leaving the shop, we checked into a motel across the street and had a late hamburger and fries at a nearby Dairy Queen. I felt much better with one of the major problems out of the way. The next morning we stopped at a small highway pull-off area about a hundred miles up the road to make a quick check of how the chain was faring, and to adjust any initial stretch out of it. The first thing I noticed was rust coming from all of the links, which was a sign that it couldn’t possibly have been a new chain, but rather a used one that had been sitting on the shelf for a long while. It would be useless to go back at that point, so I doused it with chain lube and we continued on our way. We ran through some cold, early-morning fog for about a hundred miles and crossed the Mississippi River at a small bridge near Wabasha, MN. We got to Phil’s in Augusta, WI around mid-afternoon without further incident. We visited with Phil and Connie for the rest of the day, and got a tour of his farm, including his prize collection of antique farm tractors, his new barn and his collection of goats; after which we rode to dinner with them in their huge vintage '69 Cadillac. Jim and I stayed at the Woodland Motel, just down the road. We wanted to get an early start without imposing on Phil and Connie, and I was anxious to get on the road before the morning rush hour around Chicago. Before turning in, I checked the bike over hoping that it would get me home without any more problems. We still had 1,000 miles to go and the chain had already stretched far more than it should have for only 550 miles. At times we were running 75 and 80, which was probably more than a non O-ring chain was designed for. The rear tire was also almost bald, but I figured I could squeeze another 1,000 miles out of it and the head bearings. The greatest risk was still the chain. I lubed it again and took a few pounds of air out of the tire to change the wear-pattern slightly, in an effort to squeeze a few extra miles out of it. I didn’t sleep well. We got up around 4:50 and loaded the bikes in the dark. It was chilly when we left for McDonald’s, 15 miles down the road. After breakfast, we got onto I-94 and rode only 30 miles when I felt a slight crunching in the rear again, followed by freewheeling and the engine revving, which I knew was the chain coming off. After we stopped, Jim walked back a few hundred feet to get it from where it was lying in the road without the master link. When he returned with it, he offered his bike to me to go back and see if Phil might have a link to match it. I was quite sure he wouldn’t, but he would certainly know where I could get one. There was no one stirring when I got back to Phil’s around 7:45. No one answered my knock either, so I opened the door a few inches and called out loudly through the opening. There was still no answer. I called a second time, much louder, with the door opened a little wider. Still nothing. I noticed a huge bell on the porch with a piece of rope hanging from the clapper, so I gave it a few healthy peals, which probably woke up the neighboring farmer a half-mile away. It woke Phil’s son who was sleeping in the camper, and it brought Connie running out of the barn where she had been milking the goats – but it still didn’t wake Phil. After Connie came up from the barn and woke him, we talked for a few minutes to give him a chance to wake up, after which he got dressed, got his bike out, and led me through a series of back roads to Eau Claire, about 20 miles away. The first place we came to was a Triumph motorcycle dealer. We arrived just as the shop was opening for the day. They didn’t have loose master links but he offered me a link from a new chain that he could replace later. It was the same kind of chain, with the clip, so it should match. After paying for the link, I thanked Phil and we said our second good-byes. I headed back down the interstate to look for Jim. I almost flew by him as he stood waving frantically from the high grass about 50 feet from the edge of the highway. It was 10:00 by the time I got the chain on and we were back on the road. Not long afterward, we were stuck in traffic for at least an hour approaching the Illinois tollhouse near Rockford, like so many times in the past. The heat was brutal, and the oil in the bikes was probably near boiling by the time we got back on the road where traffic was moving normally. We did well until we reached the Indiana state line where traffic was at a standstill. It was stop-and-go for at least 30 miles through the construction areas. It would have been even worse, except that partway through, a group of ten or twelve African-American “Wheels of Soul” on big Harleys went by us with the greatest of ease, weaving through the stopped traffic. They also used the left and right shoulders and made it all look so very easy. Jim and I tagged along with them and "rode with the angels" for at least 15 miles, saving us a lot of time. Altogether, we rode for 13 hours that day and finally exited at South Bend, IN around 6:30 where we got the last room at a Super 8. I was totally beat. We ate our dinner meal at a nearby 24-hour Subway. My main objective for the day was to get within a day of home before nightfall, and I figured this was close enough. It was probably our longest day on the road, time-wise, due to the chain problem and two major traffic delays. We were up at 4:30 for the final day and got breakfast at the same 24-hour Subway rather than getting off the highway later. The complementary breakfast at the Super 8 didn’t start until six, and we had a lot of miles to cover, so we skipped it. We were still a long way from home, but we were able to maintain a 70-mph average most of the day. We split on I-84 near Middletown, NY. Jim stayed with the highway and headed for his home in Cheshire, MA while I exited to head southeast for mine. By the time I got home, the chain was sagging far more than it should have for less than 2,000 miles, and the rear tire was totally bald. Of course part of the reason for the chain wearing faster was because it was a non O-ring type running at high speeds. Another reason was the badly worn sprockets. I believe it was mainly from being well worn when I got it. I changed the chain and both sprockets the following week and was thankful it got me home safely. Jim said later that he purposely passed the road he lives on when he got there, and went a few extra miles up the road and back so his odometer would read 900 miles for the day, which was the longest single day of the trip. Mine read a little less than 800. The mileage for the entire trip, according to my odometer, was slightly more than 11,000. Jim had a few hundred more than that. 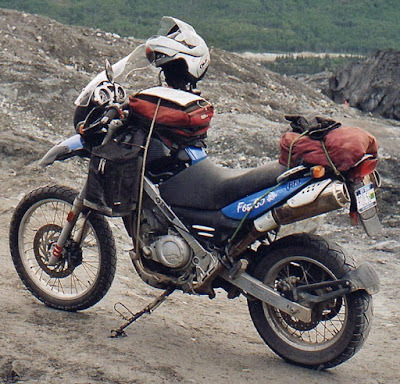 We averaged about 525 miles per day for the 12-day return trip, in spite of several short days, the lost time-zone hours, and at least a few days of dual sport riding on muddy roads in the Yukon. It was certainly a memorable adventure for both of us. I learned a great deal about traveling with a lighter weight motorcycle. Three noticeably different factors were the luggage carrying capacity, the greater effect speed has on gas mileage, and the greater effect strong crosswinds have on handling. My greatest negative was using a chain-driven bike for long-distance adventure touring in an area with so much dust and mud. The chain takes much more care and attention than a shaft-driven machine on that type of terrain. The Suzuki GS750 that I used on the 1977 and 1981 trips had a much heavier chain and a guard that protected it well.